There is nothing vain about wanting a perfect selfie. Well, maybe just a little bit – but a little vanity every now and then is nothing to be ashamed of. The truth is, we all secretly want people other than our Mom to like our images on social media. That is why even after 30 minutes and striking way too many different poses we are usually not happy with our selfie result. How come we never look as relaxed as our favorite bloggers on their self-portraits? Anyway, don’t sweat it! If you are ready to ditch the pity likes and graduate from the class of “perfect selfies 101”, you have come to the right place. With our five tips below, you can finally put your selfie troubles to rest. There is no selfie as beautiful as one where you’re glowing! And you will only get that perfect shine if you consider the lighting. To optimize lighting, take advantage of indirect sources of natural light such as a doorway or a window and take your selfies there. While you are doing this, let the light be in front of you and bring the camera close to your face – your eyes will reflect the natural light and sparkle like a diamond – and after all, diamonds are a girl’s best friend! If you are into outdoor selfies, ensure that the sun is behind you to avoid too much glare. This will definitely give you a gorgeous glow which is a huge score on your selfie game. I am sure I don’t have to remind you that fluorescent light is one of your biggest enemies! Avoid it as much as possible – unless you want a special feature on any scars and spots. The same goes for your smartphone flash! Another little helper could be an illuminated phone case – the hottest gadget that everyone is using now to get their selfies perfectly right, even the Kardashians. 😉 It helps you get the perfectly lit selfie setting. If you don’t feel like spending money just to make your selfies look more perfect, simply take a white sheet of paper or a mirror and put them next to your camera. It will reflect the light and light up your face! Remember: you are not taking a passport photo or a mug shot! So don’t just stand straight and look forward. Find the angles that bring out your best features while hiding sides you don’t like as much. Tilt your head in different directions and use your front camera to find the best shot. If you are still at a loss, start by snapping your “best side”(of course we are all flawless, but we still all have one;)). One of the surest angles is achieved by lifting your camera up while you slightly tilt your chin down. This will make the features of your face seem more aligned and help you snap the perfect selfie without too much trouble. At least it does for the self-proclaimed selfie queen Kim Kardashian! For you, it might well be something completely different. Just take a good look at your face before you start and find out which parts you would like to accentuate. And of course make sure you look natural in the angle you find the best – you don’t want to look odd by using an obviously uncomfortable pose. Need a bit of inspiration? Here are the 6 craziest selfies that have ever been taken – and trust me, they’re real too! The perfect selfie is not just about your pretty face, it’s about telling a story without using words. That said, posing with fun or interesting objects is a sure way of getting a perfect shot. Your best friend, or maybe a cute animal? Just make sure to get into character as you pose. For instance, while posing with food, act like you are seconds away from taking a bite, but first, selfie time. Speaking of food poses, you are better off holding the food in your hand and leaning into it than biting. This gives you a chance to contour your face into different expressions while telling a story all in one photo! Another advice for striking the right pose is of course: be natural! Duck faces are out of fashion now and the world is craving authenticity. If you’re posing for Snapchat or Instagram, just try to convey exactly the message you want to get across. Funny faces or intense looks – just do you! Want to get some inspiration for crazy selfies? Read about the six craziest selfies ever here. P.S. If you need a bit of inspiration, then discover our favourite Instagram lifestyle bloggers for a bit of pro-selfie inspiration! Don’t be shy – try different positions! There is no rule that says selfies are only for your face. Pop in as many interesting poses as you can to really ensure that you flaunt your curves and legs instead of standing straight. Go for the lying down pose but remember to prop up your head with a pillow to bring it closer to the camera without straining while allowing light to illuminate your face. Mirror selfie? Sure, why not! Simply keep in mind that the more the natural light available the better the selfie. Just optimize your poses and also get into character to make it look convincing. Or follow trends like the “Follow-me-to” pose to step up your Instagram game and get yourself those likes! Want to know more about Insta Trends? Read about an awkward selfie craze – the T. Rex Hand – here. By the way: if you have trouble pressing the button to take your perfect selfie, you can also always use the volume button on your phone, the timer or the voice control. Alternatively, you can stick pads to the back of your phone and then attach the whole setup in the perfect spot to take your selfie. Little helpers like this will definitely make it all way easier and you won’t have to twist your precious joints! P.S. We’ve discovered 6 ways to get the perfect selfie – without using a selfie stick! So if you do have trouble taking the picture, make sure to arm yourself with these amazing little-known selfie tips! You just took the best selfie and you are pretty sure you’ll never get another chance for your hair to float in the wind like that, but there’s this little bit of spinach quiche left between your teeth, sigh! How long must it have been there! But worry not. That’s why editing and filters were invented. There’s no shame in editing to your liking, everybody does it! You just took a killer selfie next to a dumpster? No worries, crop it out or better yet, edit the background. The idea is to take a selfie at the perfect moment if you can manipulate other factors you have no control over, why not? If you are snapping selfies for your Instagram feed, make sure you edit all of them to fit a similar look – for example always highlight cool colors. This will make your profile look super neat and trendy! Now that you are armed with all of these smarts, grab your camera and start snapping. You never know, you may even get some great comments on that perfect selfie of yours that are not from your auntie! But most of all, there is only one rule of thumb: enjoy yourself and have fun! 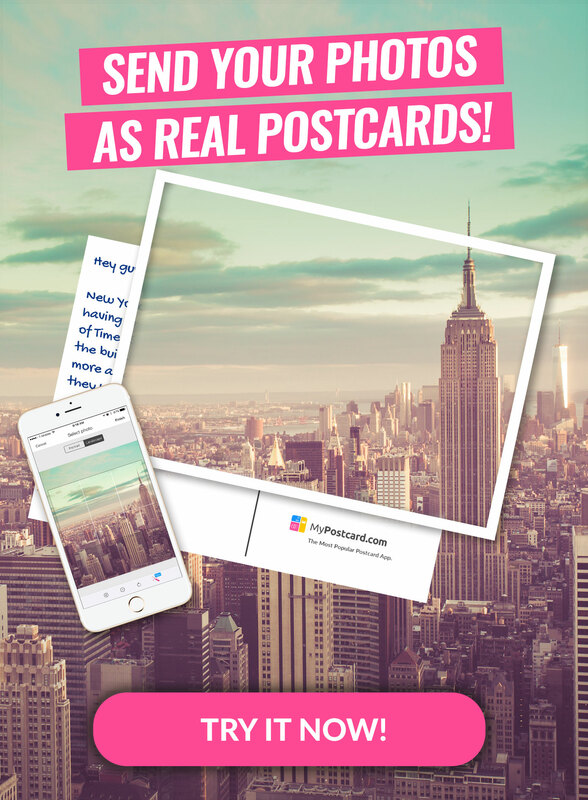 If you do snap the perfect selfie with your friends, why not consider popping it on a personalized postcard and sending it to them? And if you developed a little photography addiction, why don’t you start using your pro knowledge and start snapping beautiful portraits of others? Find some more fun and unique portrait photography tips here. If you want to get a little more inspiration first, then read this article about our favorite Instagram photography accounts you should follow! And you should be good to go – ready, set, snap selfies!